Do you feel trapped…stressed out and unhappy…burning the candle at both ends…trying to meet the never-ending demands of your business and wanting some semblance of a personal life too? Set Yourself Free! You can control your business rather than it controlling you. 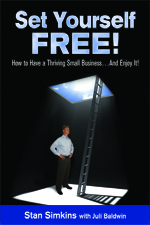 You can have a thriving business…and enjoy it! There is a way out of your prison and you hold the keys. If you prefer to listen, check out the audiobook. The hardcopy is still available at Amazon. Cash Flow… A Cause Or A Symptom? I wish I had more cash! My bank won’t give me the support I need. I wish I had access to more capital like the big guys have. These are just some of the complaints I hear from new clients. Yet, the solution to their problems often lies within reach. The cause of their cash flow problem is often a function of their lack of controls, reporting and being on top of their people to execute whatever controls and reporting they do have. resolved the issues. Would it surprise you if I said that many owners fail to stay on top of the accounts receivable before delinquencies get out of hand? You probably have heard that the best time to establish or increase your lending capacity (e.g. line of credit limits) is when you don’t need to. Yet I sometimes have to become a broken record in order to move some clients to take such action. It’s called ‘better safe than sorry’. Excessive inventories are another cause of cash flow problems and I sometimes find that the person in charge of purchasing or inventory control either isn’t following or doesn’t have a good system in place to keeping inventory levels to a reasonable minimum. Sometimes they are driven by an overzealous sales manager/owner who wants to avoid ‘out of stock’ at any cost to the company. generally a bad move especially when getting financing is harder and takes longer than in ‘old times’ (which means less than 5 years ago!). Administration says one of the leading causes of failure of small businesses is inadequate capitalization… which is impacted by your borrowing practices as well as managing accounts receivable and inventory.